Blessings dear earth angel! 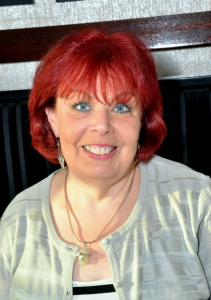 I’m Marianne, an Angelic Life Coach®, Master Teacher and unofficial Queen of Customer Care here at AngelsTeach, because my passion is to help people like you find and honor/embrace your own unique and precious gifts from within. I would not be where I am today without AngelsTeach and my personal journey, which began during a period when my daughter was battling physical and emotional health issues that necessitated frequent hospitalizations. I was a single mom and I leaned on my strong family ties and my deep Catholic faith to get me through some challenging times but I always felt like something was missing. During one of our trips to Salem, MA, which isn’t too far from where we live, we visited our favorite store for some crystals and incense and found a couple of Doreen Virtue’s angel card decks and decided to each buy one. The next day my daughter pulled a card for me and the message was extraordinary. I started reading the little book that accompanied the cards and really looking at the cards and the messages. I felt like they meshed with my Catholic faith and even enhanced it, so I started pulling a card each day and reading the messages associated with it. Soon I realized I felt a bit lighter and brighter and felt something within me beginning to blossom. I went to Doreen’s website, looking for a local practitioner and found Elvia and AngelsTeach.com. I was anxious to know more about these cards and the profound messages I was receiving. Over the course of several days, I found myself returning to the AngelsTeach website and the description of the beginner’s class. Yet, while I felt guided to sign up for next scheduled class part of me was nervous and I resisted for another week. I finally threw caution to the wind and enrolled. I attended class one and I have to admit, I felt out of my element and I doubted my own ability to equal my classmates. Even though my enthusiasm and desire to learn were as strong as ever my confidence in myself was not and I feared I would never be as good as the others. As it turns out, a setback in my daughter’s health during the early stages of the class forced me to defer my participation to a class beginning several months later. Once I began the second time around, I found that I truly felt connected with the people in this class and I was more comfortable than with the original group. In hindsight I realized I had been given my first lesson in the power of the angels, as I now believe that the angels orchestra ted the whole scenario to not only introduce me to the wonderful fellow students I would meet, many of whom I still count among my friends, but to help me be a more compassionate teacher and sensitive Customer Care Angel. My initial experience in the class was similar to many first-time students. I was filled with excitement but also worry that I could not communicate with the angels, that I would not have what it takes. But I am happy to report that, just like all students do, I found that this gift which is within each of us was within me, too! I love working with our students and our members, helping them uncover and expand their gifts from within and sharing in their joy when they recognize that they have opened their lines of communication with the angels. For this reason, I would have to say that my favorite class will always be what is now called Angel Communication Immersion … the beginning of the journey! Throughout the early part of my journey with the angels, my confidence in my own angelic communication abilities grew and as it did so did the quality of the messages I received. I felt something within me was coming alive. I felt connected with the heavens and as I grew my daily spiritual practice I felt a light beginning to glow within me. I never realized that all I had to do was ask and the answer would be given from within me. I did not need to feel alone and my eyes were opened to the continued and unconditional love and support of the angels and all those wonderful Divine Beings that were all part of my Catholicism and part of me since before birth. I felt their presence in my life in a deeper and more profound way. My life feels very rich and full now and I know that I always have my angels at my side. My daughter still has her health challenges but I have a wonderful earthly and a dynamic heavenly team that I rely on daily. However, just because the angels are part of my life does not mean every day is like a day at Disney. I experienced profound loss when my beloved mom passed in 2012, but my spiritual work has helped me know the she is always with me. My daughter recently experienced a health crisis but I relied heavily on my prayers and the prayers of so many in our community lifted on her behalf and witnessed the strength and healing they delivered. I have celebrated with and been consoled by my personal Divine Squad on multiple occasions and I feel confident that my relationships with them can only grow stronger with each passing day. I bring my natural caregiving abilities to my work at AngelsTeach and am always available to work with students and members, whether helping them understand concepts and lessons taught during class or to work on an issue that has arisen in their daily lives. Or the need may simply be to pray for the highest outcome of a situation. I believe that no question is too silly or no issue to small. My own life experiences, the challenges of being a working, single parent of a child with chronic medical and emotional health issues, experiencing profound loss of a loved one as well as being a devoted sister, aunt, friend and confidant position me to understand many issues that can affect a person. I look forward to working with each and every one of you to help you realize and develop your spiritual gifts and your extraordinary relationships with the Angels and the Divine Beings. I’m also available to help you identify ways to help yourself when faced with challenges and uncomfortable situations. I can be reached via email at revmariannec@gmail.com.Many blessings.